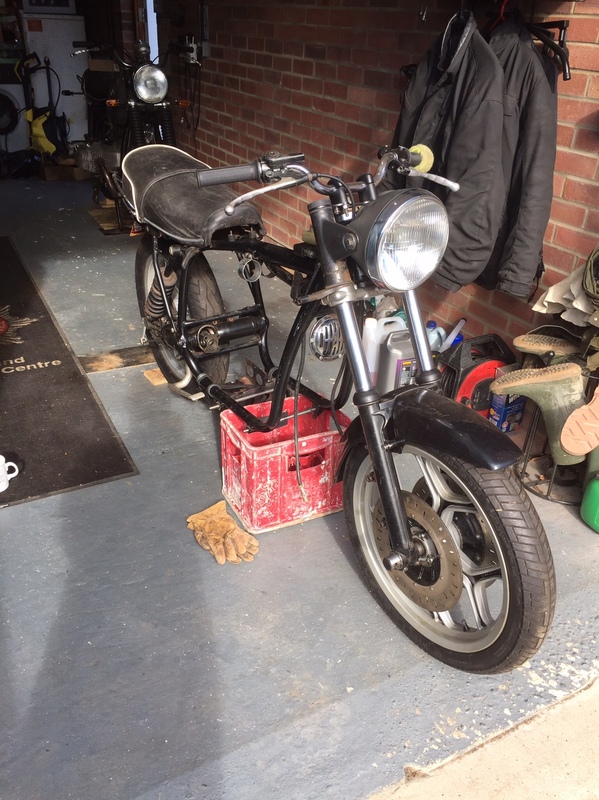 Started in December 2017 as a bare frame bought from a friend who changed his mind about building a cafe racer. 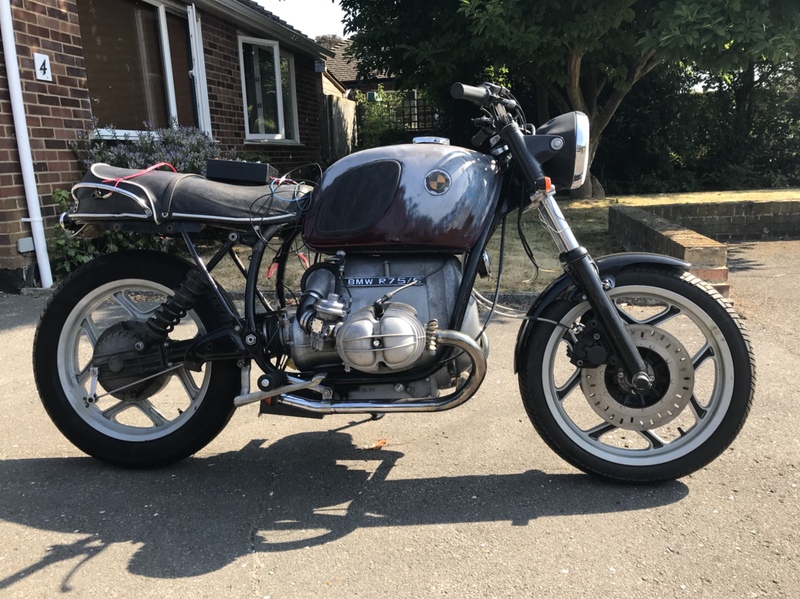 It’s a 1971 BMW R75/5. As of Saturday it looks like this. Iain McAvoy, Geordie, paradox and 11 others like this. Beautiful! More pics of the complete bike please! I'd love a cafe racer one day. I don't know much about bikes though. Are those the original wheels? Another thing on my want list..
Now you've done it! 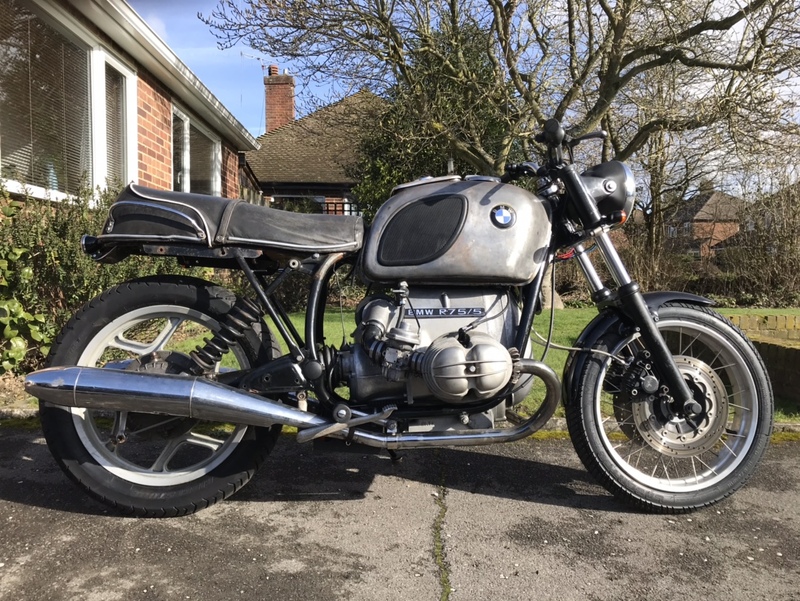 I am going to have to drag my R80RT out if the garage now. Good work though. I thought about doing a cafe racer with it 10 years ago. Now everybody's doing it, so I might just keep it as is. 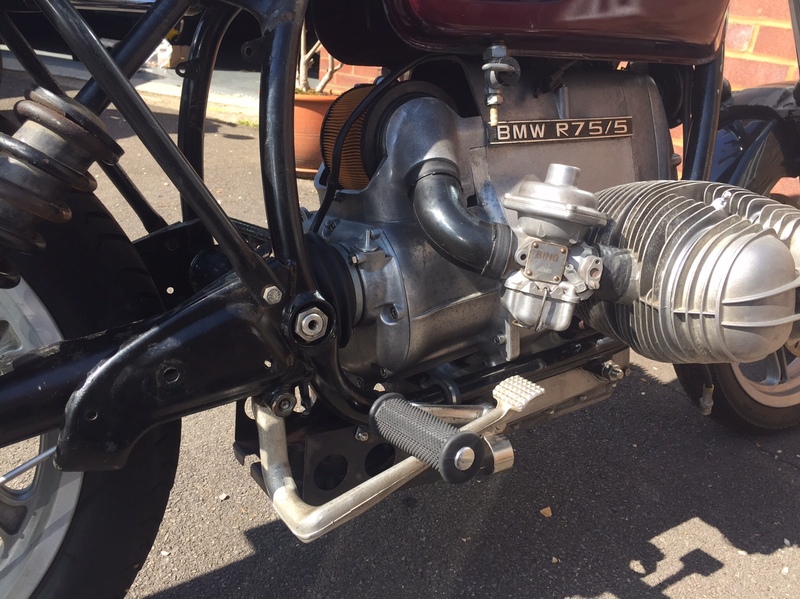 I’ve had various aircooled BMW’s over the years (since about 87) and have amassed plenty of parts - as you do. 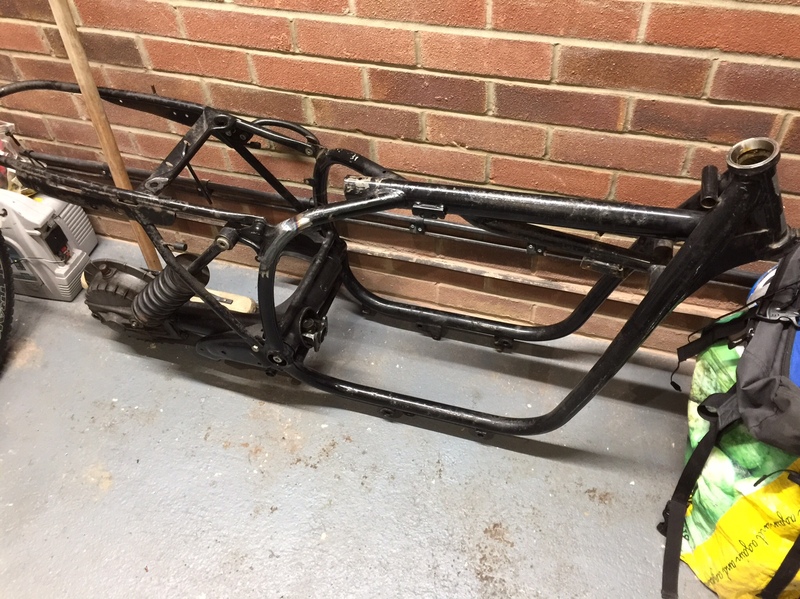 The offer of a solid pre 73 (then tax exempt) bare frame was too good to pass up. It was something to hang all my bits on. Being a 1971 model it was originally twin rear shock with spoked wheels. I’ve fitted the wheels, Brembo brakes and monoshock suspension from a later 1985 model. I don’t like the modern cast alloy wheels but they are cheap compared to their spoked counterparts. I will source some spoked wheels eventually. 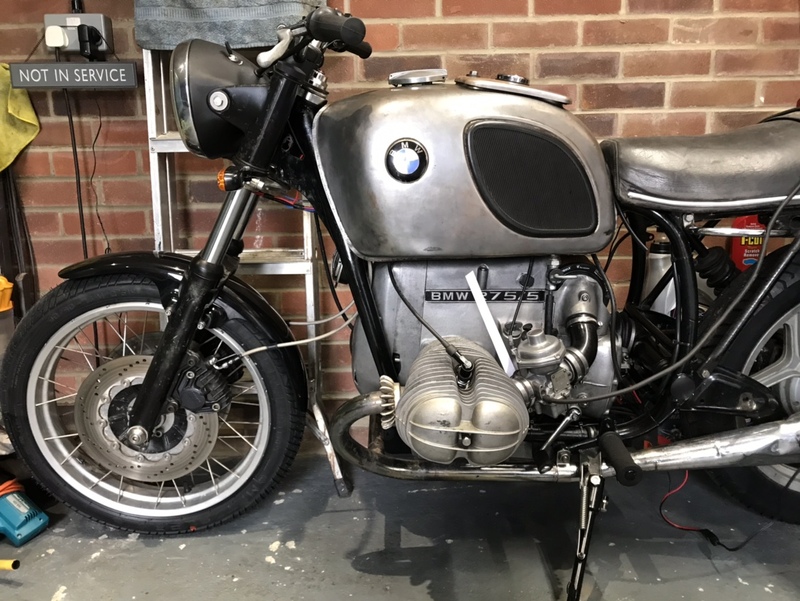 I’m not sure I could chop up a perfectly good bike to build a cafe racer but this is a right old Frankenstein’s monster and no good bikes were harmed in the build. I’ve got a V5 for the frame in my name so unlike the crew cab, no dramas getting it back on the road. and then on a roll, the gearbox and modified air filter housing. Merlin Cat and Richard W12 like this. I have a BMW too. Its a bitza beemer. Its been through the Sahara (You can just make out the alloy sump plate that was made for the job) and over the Alps. shielsy, Merlin Cat and stirlingmoz like this. Those leg shields are very retro. Cool. I used to commute on mine. 50k miles in 4 years. Sahara and the Alps ! Only a beemer can put up with that kind of use. Merlin Cat and Fish like this. Tried to get it started today but it’s fighting me. Static timing is good and I’ve got a healthy spark. 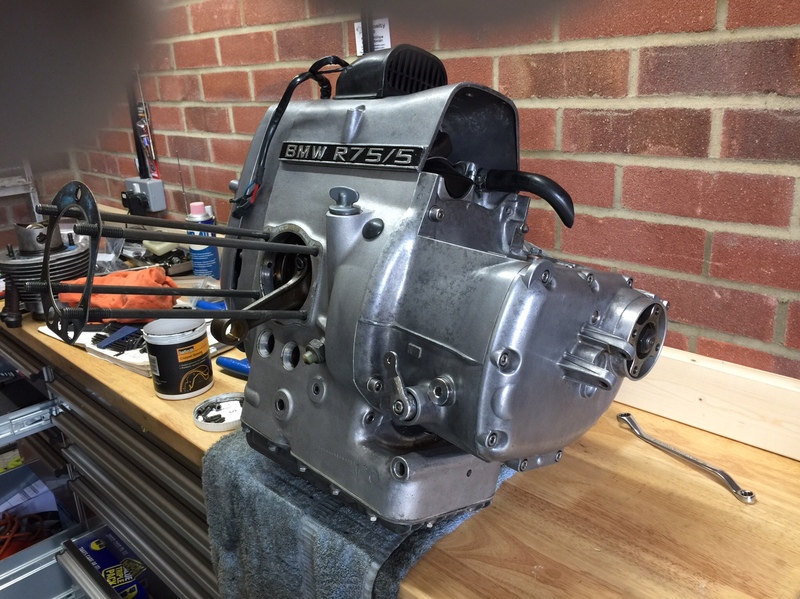 The carbs came from eBay so I might have to bite the bullet and strip and clean them. Been right through it and have sadly concluded the tip of camshaft is bent. 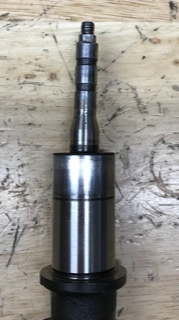 The advance retard mechanism that mounts on the tip of the camshaft and the points lobe are wobbling all over the place. I didn’t notice this with the engine static on the bench. Only when spinning it over on the starter with the occasional cough. 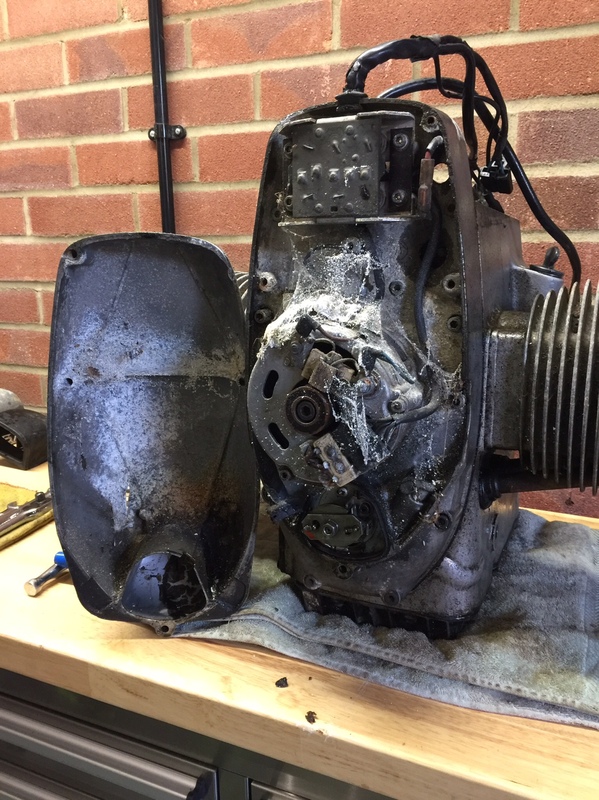 It explains why the engine was at a bike auto jumble - it was probably taken out as it wouldn’t run. I’ve just sourced a used cam but it’s going to have to be stripped again to fit it. Dunno how far you've got with camshaft replacement but surely an optical / magnetic electronic ignition wouldn't be affected by the slight bend on the camshaft- or is it worse than that ?? There are some aftermarket crankfire ignition kits that work regardless of the state of the camshaft. However they are mucho moolah. Too much for me. 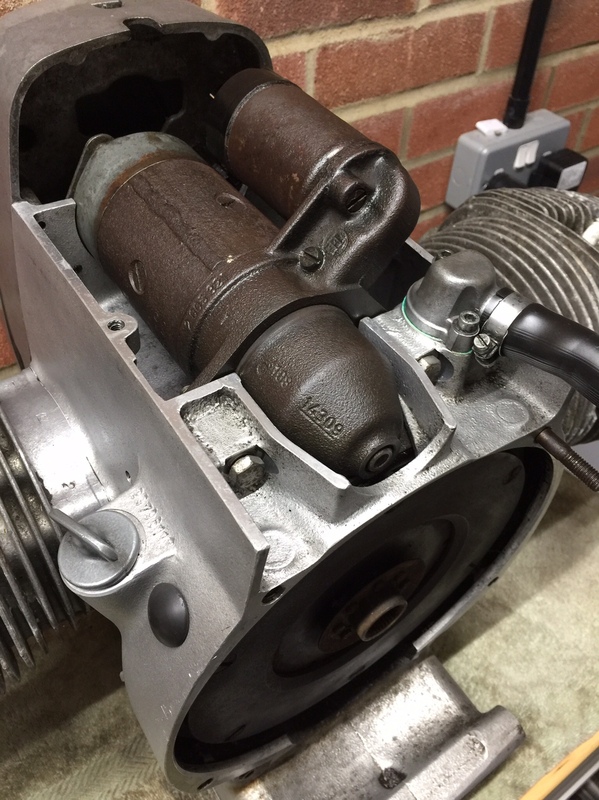 I sourced a replacement used camshaft from a later model from a marque specialist. Got it fitted and then discovered it had a different keyway for the oil pump drive. Got a suitable used oil pump (same specialist) and all new gaskets and oil seals. It was a big job to swap the cam out but my time is free. Anyway it’s all back together now and it even runs - kind of. It’s starts and ticks over but seems to hold back on the throttle. My current best guess is split diaphragms in the CV carbs. Haven’t got round to removing and stripping them yet. Next big job. In the meantime it’s been completely re-wired from scratch and I’ve stripped and cleaned the fuel tank inside and out. Couldn’t resist a set of 900cc barrels and pistons that popped up on eBay recently. I won’t bother with those until I’ve got it running right though. Should be a bit of a sleeper. Slow burning project but it’s getting there. Merlin Cat and paradox like this. Random pic of bent cam tip. This is supposed to accurately open and close the points - it didn’t. It looked alright until I tried to start it. Once it was turning the bend was very obvious. Fitted a used spoked front wheel from a later model this morning. The suspension and brakes are from a much later model and came with an alloy wheel which I didn’t think was in keeping with a 1971 machine. 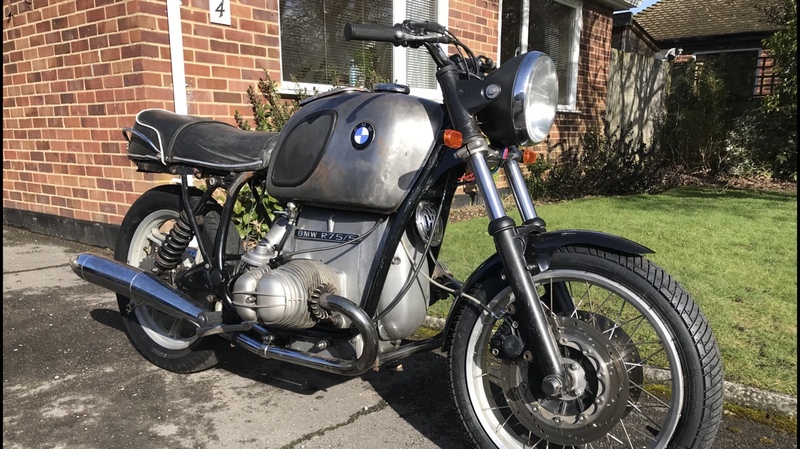 Looking to try and get this on the road by May when my insurance is due. Merlin Cat, Geordie, Valveandy and 1 other person like this. Had a visit this morning from a guru from the BMW club. I was struggling to get the bike to run nicely. 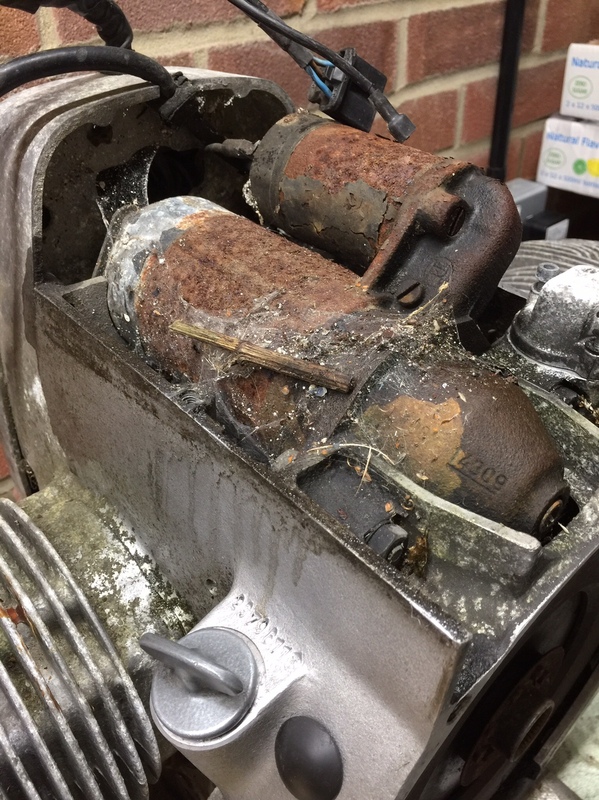 I knew the ignition timing was there but the carbs were fighting me. Anyway Bob (coz that’s his name) fiddled with the float heights, played with the mixture and air screws and balanced the carbs by ear. I enjoyed watching and chatting to him though I was really only there to make the tea. I learned loads about setting up these old things. Stuff that I’ve not read anywhere. After a couple of hours the bike was starting, idling and running really nicely. 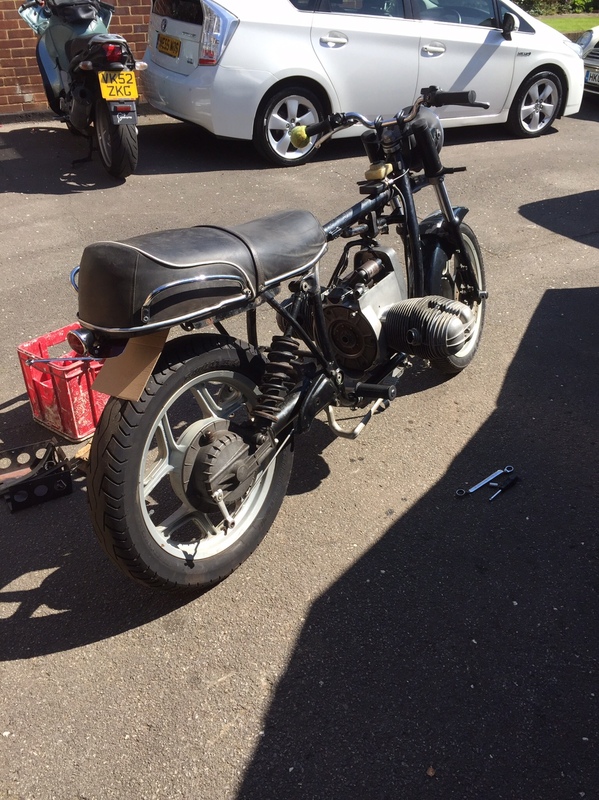 I now need to figure out how to mount the number plate and replace the worn out rear tyre and I think we’re ready for some shake down runs. Iain McAvoy, Lasty, Merlin Cat and 2 others like this.